At Kathmandu Prince Hotel, we keep service with genuine friendliness, well-maintained facilities, and a spirit of freshness and innovation at the center of our hospitality service. Of the numerous hotels or other accommodations available in Kathmandu, our guests have experienced difference with us and have returned fully satisfied. We are glad that in a just a few years after entering into operation, we have been able to win so much goodwill. 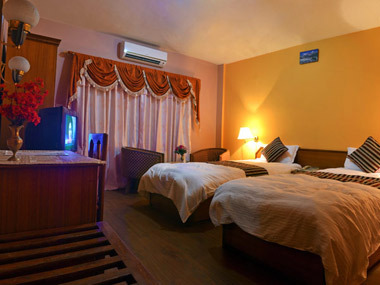 Our all 30 rooms are clean and comfortable and we constantly innovate their look and decor to make you feel fresh. We offer all the facilities that you expect from a good modern hotel. Before you make an online reservation at Kathmandu Prince Hotel, you may want to view our photo gallery, check our room rates, and even read TripAdvisor reviews of Kathmandu Prince Hotel.